We plan on a morning arrival in Rio de Janeiro where we will then transfer 2.5hrs to our wonderful new accommodation. Upon arrival at the lodge we will quickly settle in and spend the remainder of the day birding around the lodges grounds and trails. Species we hope to see include Black Hawk-Eagle, Spot-winged Wood-Quail, Maroon-bellied Parakeet, Scale-throated Hermit, Plovercrest, Violet-capped Woodnymph, White-throated Hummingbird, Brazilian Ruby, Black-throated Trogon, Spot-billed Toucanet, Yellow-browed Woodpecker, Pallid Spinetail, White-collared Foliage-gleaner, White-throated and Scaled Woodcreepers, Black-billed Scythebill, Bertoni’s and Ochre-rumped Antbirds, Brazilian Antthrush, Blue and Pin-tailed Manakin, White-rimmed Warbler, Fawn-breasted, Golden-chevroned, Azure-shouldered, Ruby-crowned and Brassy-breasted Tanagers, Uniform Finch and Green-winged Saltator. 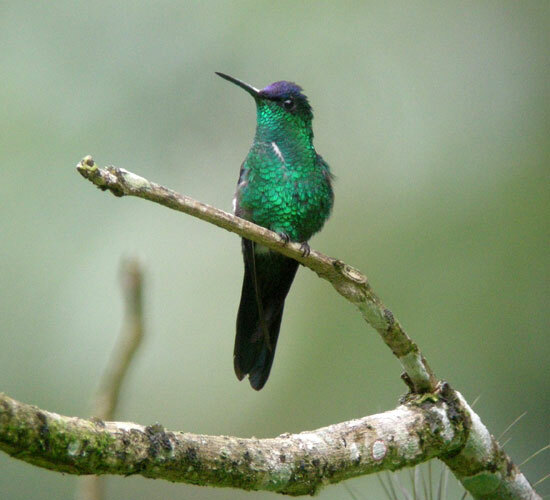 This full day excursion is aimed at seeing the small number of endemics that exist above 1500 metres. Our day begins with a 30 minute drive in the minibus to the base of Pico da Caledonia where we will be met by a 4x4 vehicle and drive as high up as possible and then bird our way down for the remainder of the day. As we drive up we will notice a change in the habitat, small stunted trees surrounded by bamboo and other low vegetation provide the first areas in which we hope to see Bay-chested Warbling-Finch, Diademed Tanager, Blue-billed Black Tyrant, Green-crowned Plovercrest and Rufous-tailed Antbird. As we continue further uphill we begin to enter the habitat where we stand a good chance of seeing the rare and endemic Grey-winged Cotinga, Serra do Mar Tyrannulet and Black-and-Gold Cotinga. We shall also try in this area for Brazilian Antthrush and Mouse-coloured Tapaculo. 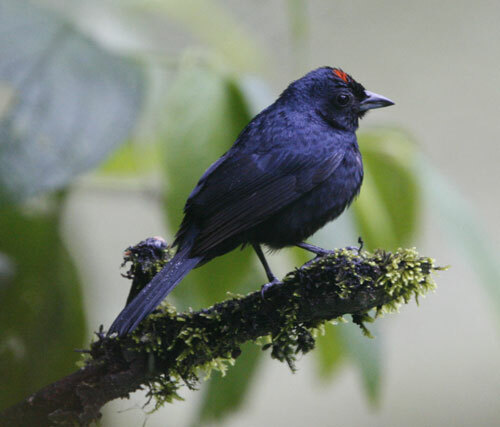 Almost at the summit we hope to encounter the rare and endemic Itatiaia Thistletail, Rufous-capped Antshrike and Velvety-black Tyrant. Today we will spend a full day in the lodge grounds walking the Blue Circular Trail and the Orchid Garden Trail. These two trails offer fantastic birding through native bamboo, primary and secondary forest giving us the chance of seeing many Atlantic forest endemics without even leaving the Lodge grounds! Today we hope to see some of the following species: Brown Tinamou, Dusky-legged Guan, Spot-winged Wood-Quail, Black Hawk-Eagle, Black-and-White Hawk-Eagle, Barred Forest-Falcon, Maroon-bellied Parakeet, Scaly-headed Parrot, Scale-throated Hermit, White-throated Hummingbird, Plovercrest, Brazilian Ruby, Surucua and Black-throated Trogon, Saffron and Spot-billed Toucanets, Yellow-eared and Yellow-browed Woodpeckers, Rufous-capped, Pallid, Grey-bellied and Chicli Spinetails, White-browed, White-collared, Buff-browed and Buff-fronted Foliage-Gleaners, White-throated, Lesser, Scaled and Olivaceous Woodcreepers, Black-billed Scythebill, Giant and Variable Antshrikes, Star-throated Antwren, Bertoni’s, Ochre-rumped and Dusky-tailed Antbirds, Rufous-backed Antvireo, Rufous-tailed and Cryptic Antthrushes, Rufous Gnateater, Spotted Bamboowren, Mouse-coloured and White-breasted Tapaculo, Grey-capped Tyrannulet, Grey-hooded Flycatcher, Drab-breasted Bamboo-Tyrant, Grey-hooded Attila, Sharpbill, Greenish Schiffornis, Rufous-crowned Greenlet, Yellow-legged Thrush, White-rimmed Warbler, Half-collared Sparrow, Chestnut-headed, Black-goggled, Ruby-crowned, Azure-shouldered, Golden-chevroned, Fawn-breasted, Brassy-breasted and Burnished-buff Tanagers, Uniform Finch and Green-winged Saltator. Today we will take a drive of just over an hour to the Reserva Ecologica de Guapi Acu where we will spend a full day exploring the wetland areas together with the lowland forest. Species we expect to see here amongst others include Whistling and Capped Herons, Brazilian Teal, Masked Duck, Grey-headed Kite, Savanna Hawk, Limpkin, Yellow-chinned Spinetail, White-headed Marsh Tyrant, Yellowish Pipit and Chestnut-capped Blackbird. Surrounding the wetland is lowland forest, a habitat very difficult to encounter as much of this habitat has been destroyed in the past, and we venture into this forest in the hope of finding species such as Reddish Hermit, White-chinned Sapphire, Rufous-capped Motmot, Rufous-tailed Jacamar, Crescent-chested Puffbird, Yellow-throated Woodpecker, Chestnut-backed Antshrike, White-flanked Antwren, Unicolored Antwren, Brazilian Laniisoma (Shrike-like Cotinga) and Long-billed Wren. Many birders who visit south-east Brazil go in search of the endemic Three-toed Jacamar and on this full day excursion we visit several sites where this bird is regularly found. Along the way we pass through a variety of habitats and cover a fair distance (140 km) stopping regularly en-route to look for other species. Our target bird is the Three-toed Jacamar(! ), however... other birds we could encounter include Whistling and Capped Herons, Lesser Yellow-headed Vulture, Savanna and White-tailed Hawks, Laughing and Aplomado Falcons, Red-legged Seriema, Blue-winged Macaw, White-eyed Parakeet, Blue-winged Parrotlet, Striped Cuckoo, Planalto Hermit, Glittering-bellied and Sapphire-spangled Emeralds, Amethyst Woodstar, White-eared and Crescent-chested Puffbirds, Black-necked Aracari, White Woodpecker, Band-tailed Hornero, Orange-eyed Thornbird, Ochre-faced Tody-Flycatcher, Grey and White-rumped Monjitas, Streamer-tailed, Yellow-browed and Long-tailed Tyrants, White-rumped and Tawny-headed Swallows, Black-capped Donacobius, Curl-crested Jay, Magpie, Hooded, Hepatic, Brazilian and Gilt-edged Tanagers and Hooded Siskin. After a 35 minute drive from the lodge we arrive at the beginning of the Cedae Trail where we will spend the morning birding this great trail that starts at approximately 600m in altitude. Our targets for this morning include Plain Parakeet, Saw-billed Hermit, Black-throated Trogon, Rufous-capped Motmot, Buff-bellied Puffbird, Saffron and Spot-billed Toucanets, Channel-billed Toucan, White-barred Piculet, Yellow-eared Woodpecker, Pale-browed Treehunter, White-browed, Black-capped and White-eyed Foliage Gleaners, Plain-winged and Lesser Woodcreepers, Spot-backed Antshrike, Rufous-capped Antthrush, Spot-breasted and Plain Antvireos, Ferruginous Antbird, Streak-capped and Star-throated Antwrens, White-shouldered Fire-Eye, Black-cheeked Gnateater, Blue and Pin-tailed Manakins, Grey-hooded Flycatcher, Oustalet's Tyrannulet, Eared Pygmy-Tyrant, Black-tailed Tityra, Rufous-headed, Yellow-backed, Olive-green, Flame-crested, Green-headed and Red-necked Tanagers and Black-throated Grosbeak. After birding this trail we will then take a short drive to the beginning of the Theodoro Trail, commencing at 1100m in altitude this path offers superb birding. 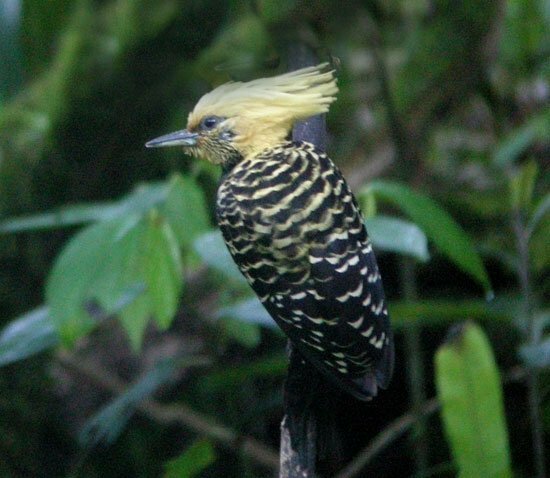 Birds that can be seen include Mantled Hawk, Plain Parakeet, Scale-throated Hermit, White-throated Hummingbird, Surucua Trogon, Yellow-eared and Yellow-browed Woodpeckers, Streaked Xenops, White-browed and Buff-fronted Foliage Gleaners, Sharp-tailed Streamcreeper, White-throated Woodcreeper, Variable Antshrike, Star-throated Antwren, White-shouldered Fire-eye, Slaty Bristlefront, Brazilian Antthrush, Variegated Antpitta, Sharpbill, Grey-hooded Atilla and Brazilian Laniisoma. After a 20 minute drive from the lodge we arrive at the beginning of the track towards Macae de Cima. Depending upon weather conditions we may leave the minibus and take a gentle walk or the minibus will accompany us for the next few hours. Birds we hope to see on this trail include Plumbeous Pigeon, Scale-throated Hermit, Plovercrest, White-throated Hummingbird, Brazilian Ruby, Yellow-browed Woodpecker, Rufous-capped and Pallid Spinetails, Orange-eyed Thornbird, White-collared Foliage-Gleaner, Giant, Tufted and White-bearded Antshrikes, Bertoni’s and Ochre-rumped Antbirds, Rufous Gnateater, Black-and-Gold Cotinga, Bare-throated Bellbird, Pin-tailed Manakin, Serra do Mar Tyrant-Manakin, Drab-breasted Bamboo-Tyrant, White-rimmed Warbler, Chestnut-headed, Azure-shouldered and Brassy-breasted Tanagers, Slaty Bristlefront, White-bibbed Antbird, Black-billed Scythebill and Green-winged Saltator. After approximately 40 minutes drive we arrive at our destination and leave the minibus to walk a trail for the morning. What makes this excursion so good is the mixture of habitats that this area offers, it is also a stronghold for the endemic Half-collared Sparrow, which is sometimes difficult to see in other areas but this species is abundant here. Other birds that we expect to see during the morning include Dusky-legged Guan, Scale-throated Hermit, Glittering-bellied Emerald, White-throated Hummingbird, Saffron Toucanet, Rufous-capped, Grey-bellied and Pallid Spinetails, White-collared Foliage-Gleaner, Black-billed Scythebill, Giant Antshrike, White-bearded Antshrike, Rufous-backed Antvireo, Bertoni’s Antbird, Azure-shouldered, Brassy-breasted and Gilt-edged Tanagers, Buffy-fronted Seedeater and Uniform Finch. We will return to the lodge early afternoon and spend the rest of the day birding the Green Trail in search of Spotted Bamboo Wren, Mouse-coloured Tapaculo and Such’s Antthrush amongst others. Any spare time before departure back down to Rio de Janeiro can be spent doing photography at the lodge feeders or birding some of the trails in the lodge grounds going after any species that we may have missed earlier on in the week. Night Birding: Within the Itororo Lodge grounds we are lucky enough to have Long-trained Nightjar, Pauraque, Short-tailed Nighthawk, Tropical Screech-Owl, Rusty-barred Owl and Striped Owl. 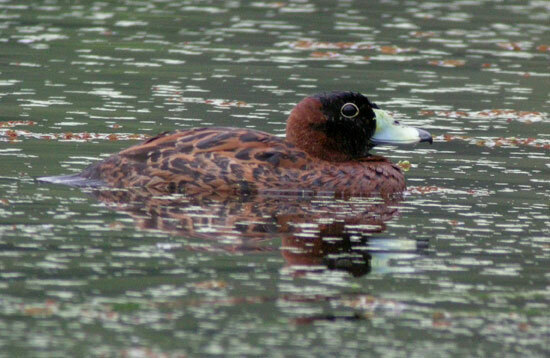 During the course of the week we will go out searching for various species on a couple of nights.